So, this weekend was the final Stitches East in Baltimore (it moves to Hartford next year, I believe), and therefore probably my last year to attend. There weren’t any classes that really grabbed me this year, so I just went up for the Market. I got up bright and early on Friday, and met Carrie and Maryanne at the light rail station (BEST way in the world to get into Baltimore). We were lucky that we were starting at the end of the line, because according to the announcement we heard as we were boarding, they were doing some sort of maintenance, and were therefore only running single-car trains instead of the usual 2- or 3- car trains. People who got on at the stop after us didn’t even have a chance at a seat. I ended up sitting with this older guy who was going in to the hospital for his final radiation treatment. He was very sweet, and it was fun chatting with him. Anyway, Stitches was, well, Stitches. The Market is overwhelming. 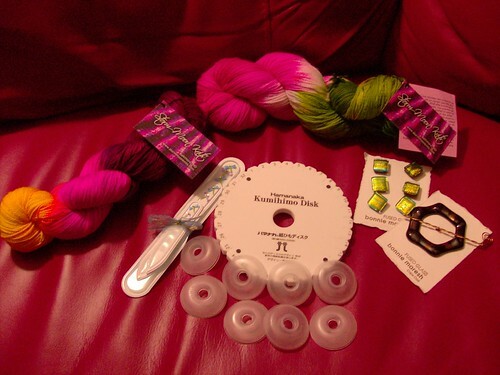 I had decided before going that I was not buying yarn – books, patterns, tools, yes. Things to help use up the stash, but nothing to ADD to it. I almost made it. However, if you remember past years, I’d say I was downright restrained. The nail files over on the left are glass ones with little handpainted dragonflies on them. If you’ve never used a glass nail file, they are really awesome. And I’m not one of those people who is all “OMG! I broke a nail! Waaaaah!”, but it does bug the crap out of me if I’ve got a rough spot snagging on things, so it will be nice to have these handy to deal with those moments. Plus, the glass files last for freaking ever. ETA: Almost forgot – I also picked up a copy of “Malabrigo: Book One” by Cornelia Tuttle Hamilton. I found a sweater in there that I thought would be great for the Malabrigo Worsted that I picked up for Kris ages ago. Unfortunately, I misread the requirements, and I don’t have anywhere near enough. I might make it for him out of something else eventually, though. Both hanks of yarn are from the lovely Lindsay at Storm Moon Knits. I also picked up a little something just because it cracked me up. 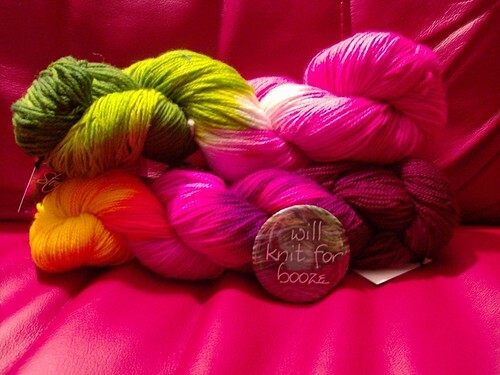 Yes, the button says “Will knit for booze.” I believe in truth in advertising. (Apologies for the color. Red background + incandescent light makes for some oddness) The top skein is Twilight Sock in “Peace and Love“, a colorway Lindsay created in memory of her friend’s 12-year old daughter, who passed away this summer from Severe Aplastic Anemia. She is donating the proceeds from the sale of this yarn to Days End Farm Horse Rescue in Woodbine, MD, where Gabrielle spent time volunteering. It’s a beautiful color, and the sentiment is something I had to support, especially with all of the support that Hats for Alex has gotten. The other skein is Tornado Sock in “That Girl Is Poison”, which I bought totally because I fell in love with the color. Splurge, I admit it. The Peace and Love will be a Boteh Scarf, since I love my first one so much. I’m going to start on that as soon as I finish Kris’s sweater. My last Stitches was lots of fun, although it wasn’t the same without you here, Betsy! I did get to see lots of people, some who were old friends and some who have become new ones. And some who saw me but didn’t say hello, so I still haven’t gotten to meet them (You know who you are…). November 9th, 2008 | Tags: Knitting, NaKniSweMo08, Stitches East, WIPs | Category: Misc. I’ve never ever heard of that disk thingy, but WOW, that cord it makes is awesome! Sweater is looking great. I’m going to order that book tomorrow (after taking a quick look at local bookstores). I’m not a nail file person, but you’re right. I can actually stand to use glass ones. They’re awesome. Awesome enough that I’m still using my broken one. You’re only at 57%? That seems low. But I guess the sleeves are an awful lot. Pretty much another body if you were to combine ’em I suppose. It’s looking good! And thanks, btw. Now I have “Poison” stuck in my head. Glad you had a nice time at Stitches East. I didn’t realize they will be moving, but never really anticipated going…mayde I will do the South! You did good on your items! What does the disc do?? And I gotta try a glass nail file! You were only restrained because I wasn’t there to push yarn on you (because if you buy, then I can buy, right?). Glad you enjoyed Stitches although I did miss hanging out with you & the yarn this year. We’ll just have to find another yarn-type event to do next year. That sweater is lookin’ good! 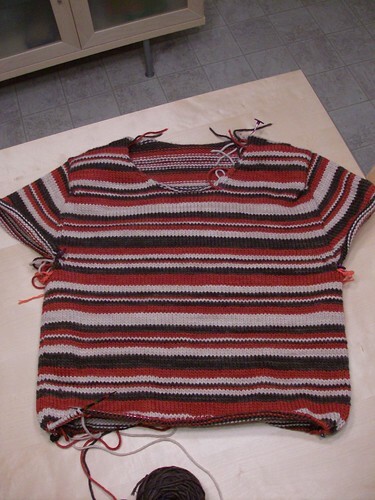 Whoa, the sweater is looking good, don’t envy you the ends though. Nice little haul there too. 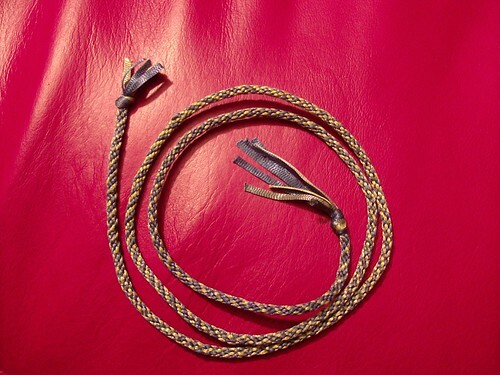 I have a friend that got one of those kumihimo disks, nice looking braid. Love the button too! Oh, i hate weaving ends! I have a sweater that’s been hibernating for my oldest daughter because it uses odd number rows so I have a lot of ends to weave. I’m thinking of changing the row count so that I can just carry up! I think you did a fabulous job in the yarn restraining!! Stitches is just sooooo tempting!! Love what you got! It’s funny – as soon as I saw your skeins I recognized the colourways because I had thought to buy them myself! (I went with Rockabilly Blues instead). It’s moving to Hartford? Shoot, that’s more doable for me. ARe those rubber disks part of your disk? And dude, where the heck do I get a button that says will knit for booze?!? I totally need one of those. Especially to wear to the bar on knit nites! LMAO!! How did I miss you? I found Jo… you mean I walked that whole floor for four hours and never saw you???? You did very well denying yourself yarn. Two skeins of a sock weight just doesn’t count. I still need to learn to crochet just to make the Boteh. I absolutely love the look of that pattern. 57% and only day #10 is impressive. That cord thing is fascinating, I’ve never seen one before. Got to look that up. Looks like more than 57% to me! Dayum woman!